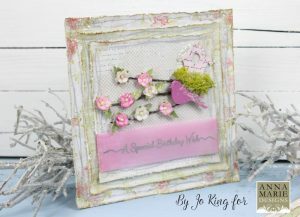 Hi, it’s Jo again and today I’m sharing a quite quick, pretty card which is much more simple in design and layout. 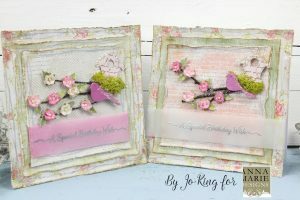 My inspiration for this card came after all the snow and rain we’ve recently had and I was thinking, I really can’t wait for the blossom to appear on the trees. 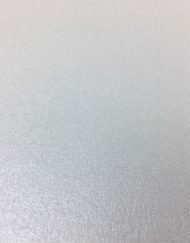 The base card is an 8” x 8” Mont Blanc card – I find these perfect as they are very strong and will easily take all the papers and embellishments I throw at them! I layered up various different papers from the Blissful range, distressing the edges a little and adding some distress inks and faux stitching. The main image is just a couple of twigs from my garden with the bird coloured with Inka Gold wax and the birdhouses painted and then stamped with my favourite Viva text stamp. 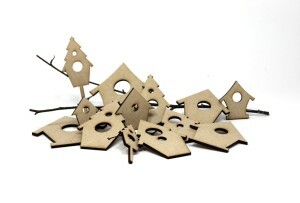 It might be worth noting that both the MDF birdhouses and die cut birdhouses take this paint well. 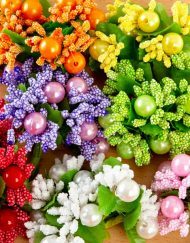 Small flowers were then added. I felt it needed some greenery so I added a couple of the small leaves from the laser cut leaves and a small amount of moss. When it came to the sentiment, I just couldn’t make my mind up! Firstly, I heat embossed a sentiment onto one of Anna Marie’s vellum strips and then I decided to experiment a little as I felt it needed a bit more colour. Once again, I heat embossed the sentiment, however, this time, I coloured the back of the vellum with an alcohol marker to achieve the desired effect. Finally, I just wrapped the sentiment strips around the layer of paper and adhered it on the back so nothing showed through the parchment. I’m still not sure which one I prefer! 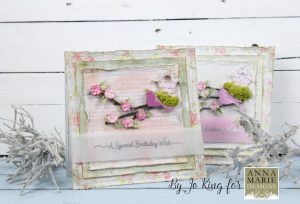 I hope you like the cards and it will show you that you don’t have to spend hours on one card – once I had the idea in my head, it took approximately 15-20 minutes to complete. 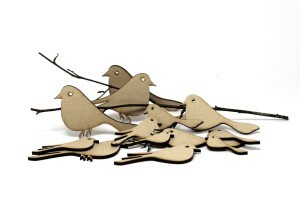 I’ve listed the products used which can be obtained from Anna Marie Designs – apart from the twigs of course! Products Used: 8” x 8” Mont Blanc Cards, Blissful Paper Pads, Small MDF bird, MDF Birdhouse and Laser Cut Birdhouse and leaves, Inka Gold, Americana Décor ‘Promise’ Chalky Paint, Viva Stamp, Blossom Flowers, Moss, Vellum Strips, Crushed Ice.